Chimney Solutions provides quality chimney sweep services in Brookhaven GA and across the Greater Atlanta area, including Sandy Springs GA, Dawsonville GA, Smyrna GA, Canton GA, Acworth GA, and more. 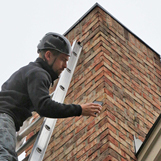 Trust in our chimney pros to deliver quality workmanship and dependable service for all of your chimney needs, such as chimney cleaning, chimney repair, chimney liner installation, chimney restoration, chimney crown rebuilding, masonry work, and tuckpointing. Homeowners in the town of Brookhaven GA turn to us for annual chimney maintenance, chimney repairs, and chimney inspections. Our superb reputation has helped us gain thousands of satisfied customers over the years. Residents can rest assured knowing that every chimney technician is CSIA certified and trained, and our professional crew will always arrive on time, in uniform, and in a clearly marked company vehicle. 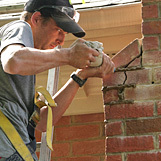 Established in 1998, Chimney Solutions has been providing quality chimney services to residents in Brookhaven and the surrounding towns and communities. From historic chimney restoration to fireplace insert installations, wood stove repair, and even chimney cap replacement, our fireplace & chimney pros will always deliver the best results for fair & honest prices. Up & down Rt 141, and across Peachtree Rd & Johnson Ferry Rd, residents can spot our company trucks traveling from home to home to service chimney systems across the area. From the Peachtree airport to the Peachtree Golf Club and Murphey Candler Park, local homeowners have come to know the friendly faces of Chimney Solutions. Chimney relining services, rain pan & shroud installations, gas fireplace & stove service, chimney cleaning, dryer vent cleaning, and masonry repair are just a few of the chimney sweep services we provide. You can count on us for any and all of your chimney maintenance needs. Our courteous staff will provide you with a fair estimate, and our techs will gladly explain any recommended work in detail. We stand behind our good name, so find out why we’ve become Brookhaven’s chimney contractor of choice. As current members of the National Chimney Sweep Guild and the Chimney Safety Institute of America, we remain on top of service policies, best practices, and top-of-the-line products that are introduced in our industry. Buyer beware. Don’t get scammed by “cheap sweeps”. If you notice an ad from a “chimney sweep” that promises prices that are too-good-to-be-true, think twice about hiring them. There are a number of deceitful chimney services companies across the area that bait homeowners in with low prices on common chimney sweep services. They know that these minor maintenance services are not how they will make a profit, so their main goal is to upsell homeowners into thinking expense repairs & services are necessary. Never agree to extensive chimney services without a second opinion from a reputable chimney sweep first. These unscrupulous companies know that homeowners are generally unaware of the current condition of their chimney system and they use this to their advantage to scare homeowners in to agreeing to costly repairs. Always be safe rather than sorry, and don’t let the safety of your chimney & venting system rest in the hands of untrained “technicians”. Trust the professionals of Chimney Solutions for fireplace, stove, furnace, chimney, or venting system service in Brookhaven GA.
Chimney Solutions is the chimney sweep service provider of choice for the Greater Atlanta area. Call today to schedule your appointment.